While living in Australia for seventeen years, I never found a better place to be than near Table Mountain. It is as if this giant flat rock energizes and inspires those who live near it. Table Mountain is a sacred place, one can say that it is the most southern sacred natural phenomena in Africa, perhaps even in the world? Table Mountain is officially accepted as one of the natural wonders of the world. 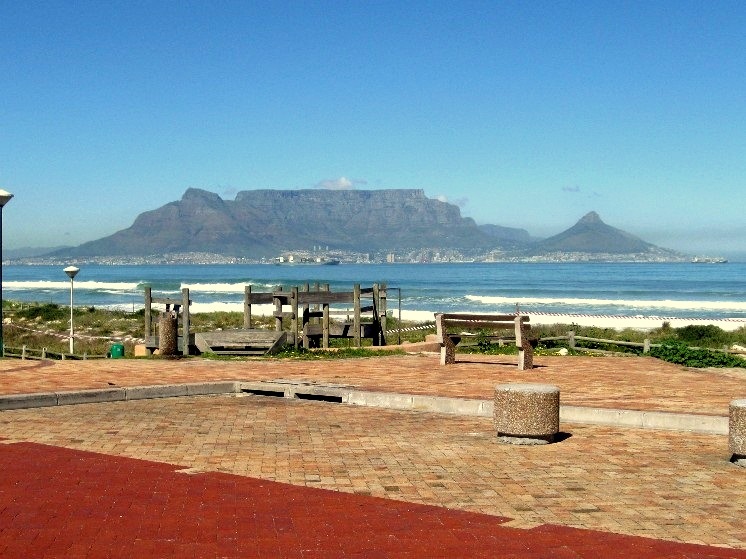 The best view of Table Mountain is from Marine Drive (Blaauwberg) strand, or finding a FULL mountain view holiday apartment in BIG BAY area, WALKING DISTANCE FROM THE BEACH is something that visitors should aim for. I may have expressed negative views about the changes in this area in my blogs. I love nature in all forms and it hurts when humanity tramples over God's gifts driven by a limited vision with little thought about the long-term effect on the environment and the heritage we leave to our descendants. 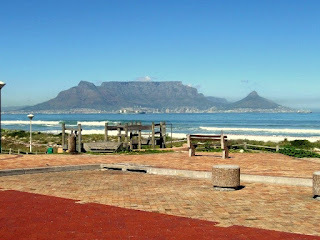 The thing I missed most while living overseas was Table Mountain. We saw Table Mountain every day of our lives. We got so used to the mountain that we took it for granted. Table Mountain was our subconscious compass. Whenever I left Cape Town, I could not find my direction. When I was a child, Milnerton was a small town in the bush and Tableview the forest where we would come for a picnic on Sundays. Blouberg was just a windy beach with shifting sands belonging to nature and the birds. I returned to South Africa in 1990 and decided to make Tableview my home, now a fast expanding town. When I first moved there, we could safely walk through bush land near our home but in less than a ear it was considered too dangerous as crime and violence became a way of life. Soon this bush land was to make place for houses; the town of Parklands and beyond. That too is now totally replaced by houses and shops. There are so many new residents in this area, with the majority totally out of step with nature. MOST OF THE TREES ARE NOW REMOVED. African settlers are now living in formal and informal settlements where nature used to abound. Where we once used to picnic, when I was a child, is now an expanding built-up area. Only Rietvlei was to be preserved for nature and generations to come. That changed when the conservation department decided to remove all trees they regarded as alien to encourage the growth of fynbos (Natural Cape Vegetation) yet not taking in account the effects of global warming, the birds and animals that have for many years made this vlei area their home. We fought for the last few large trees to remain so that the Fisheagles had somewhere to sit but our pleas fell on deaf ears. The birds had to find somewhere else to go. They were no longer welcomed at Rietvlei. They are tall tree loving birds thus regarded as alien. All this had to give way for the folly of conservation. Most of the land that has been cleared turned into dry grassland that catches fire every year, killing animals and plants in its wake. Africa is in my blood. At cellular level I can never swap the lion for the kangaroo, but sometimes I now long for the peace and crime free existence we had in Australia where racial discrimination is focused on empowering the minority aboriginal groups. I NO LONGER LIVE IN CAPE TOWN. IT IS MY INTENTION TO BLOG SOME OF THE BEAUTIFUL PHOTOS IN MY ALBUMS AND TO SHARE SOME STORIES FROM THE OLD DAYS - IF I GET TIME BECAUSE I NOW LIVE AT THE MOST SOUTHERN POINT OF AFRICA AND A NEW BLOG "MY MOST SOUTHERN VIEW, WILL SOON BE IN THE MAKING" TO REPLACE THIS ONE.